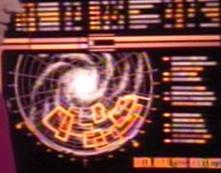 In TNG, we saw our first real maps of the civilized galaxy. To the left, we have a map seen in "The Chase," while to the right is a painting of the Federation, seen in "Conspiracy." The latter image suggests strongly that the Federation is at least a couple thousand light years across and several times as long. "The Chase" shows roughly one fifth of the galaxy broken up into boxes, the largest of which are roughly 20,000 light years on a side. These may be borders, which, at least on a two dimensional projection, overlap somewhat. That borders between political entities exist is firmly set in TNG. The galactic map is fully consistent with "The Dauphin," in which Wesley Crusher states that 19% of the galaxy has been charted. Earlier, in "Where None Have Gone Before," just over a year prior, this figure was 11%. In a galaxy with 400-600 billion stars, the Federation has mapped ~100 billion. If both figures were correct at the time they were spoken, then the Federation has been charting roughly a thousand systems per second; if this rate is sustained, the Federation should have the entire galaxy mapped by 2400. "The Chase" suggests this rate has not been sustained, as only ~20-25% of the galaxy is neatly placed in boxes on the galactic map. The Federation has border posts, sensors, etc. There are full members of the Federation, but also associate members, protectorates, and even uninhabited planets like Galorndon Core by the Neutral Zone. The Neutral Zone is roughly 2.5 light years thick near Galorndon Core. A well traveled Romulan may have visited hundreds of worlds within the Romulan Empire, giving a lower limit to the territory held by the Romulans. Although alternate uses of the term "quadrant" (e.g., the Morgana Quadrant) continued in TNG, the familiar greek letter designations referring to quarters of the galaxy began in season 3 with a wormhole to the Gamma quadrant. The Barzan wormhole has a stable Alpha Quadrant terminus, but its Gamma Quadrant terminus migrates unpredictably. "Gambit" places a sector as at least 2.37 light years in radius... in fact, more than a day across at "maximum warp" for the Enterprise.